Just when you think the U.S presidential campaign cannot get any stranger, Donald Trump has tweeted a fan-made Mass Effect ad to his millions of followers complete with music and voiceover. Update: The video is no longer available due to a copyright claim from EA. Shacknews will update as more information becomes available. Original Story: The U.S. presidential race has gone a bit off the rails lately. 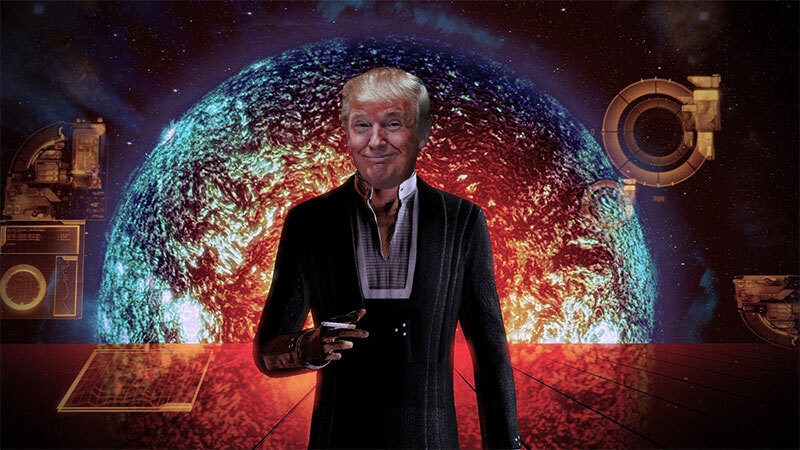 Donald Trump is known for his bombast, and a fan-made campaign ad invokes the Republican multimillionaire as Commander Shepard from Mass Effect. He tweeted this (via Kotaku) to his millions of followers earlier today. Of course, Trump's campaign didn't make the ad, as it is traced back to what could conceivably be a troll poking fun at Trump. But Trump used it, raising some interesting points. Since Mass Effect is EA property, it raises rights questions regarding the voiceover and music--not to mention that Martin Sheen's voice has just been used to endorse a candidate, whether he wanted to or not. We've reached out to EA to untangle the legal questions. And just what is the Trump Effect? If Trump really identifies with Shepard, is he willing to take on an Asari lover? Would he save the Quarians or the Geth? Or is he more of an Illusive Man, advocating a "humans first" mantra? This really is comedy gold. We will update if we get a response rom EA. I'm not really sure how to feel about this. Funny is still funny. Stupid is still stupid. What does this have to do with mass effect? The music and the Martin Sheen voice over are from the Mass Effect game. Oh. I was listening at pretty low volume since I'm at work. That's even more ridiculous when you realize that the voice in the trailer is the Illusive Man, who if he's not the villain of ME2, he's certainly a neutral-ish antagonist. And, it's doubly ridiculous when you realize that the character is voiced by Martin Sheen, who is a notorious liberal activist. The Illusive Man is an extremist who uses his vast wealth to promote programs that elevate his race above all others in civilization. He is trying to make the Millennials look bad. EA, your mission is clear. Sue Trump. The illusive man is basically an interstellar racist with too much money that builds mega structures all over the place and want them damn aliens out of human space. He's making the colonies great again. The vid.me link in the article still works. Gross. Also, love the irony.